WINCHESTER — The tapestry of Guy Strong’s life in sports, intricately woven over seven decades, is made up of his many accomplishments as a player and coach, and all the notable people he influenced and befriended along the way. It’s difficult to quantify, and impossible to fully appreciate, everything Strong experienced from the time he was a star athlete at Irvine High School in the late 1940s to when he retired as basketball coach at George Rogers Clark in the early 2000s. But the 88-year-old former coach and educator knows he had an exhilarating ride, most of which he was lucky enough to share with Aleen, his wife of 64 1/2 years before she passed away in 2016. He led Irvine to the 1948 Sweet Sixteen basketball tournament, and a couple months later sparked the Golden Eagles to the state baseball tournament. Guy Strong was a member of UK’s 1951 NCAA championship team. He played basketball for Adolph Rupp at Kentucky and was on the Wildcats’ 1951 NCAA championship team. He coached Kentucky Wesleyan to its first NCAA college division basketball championship in 1966. He coached George Rogers Clark High School (Clark County) to the Sweet Sixteen three times in a five-year period, including a trip to the final four in 1990. He had an overall record of 541-355 in 34 years as a high school and college basketball coach. He’s a member of the Kentucky Athletic Hall of Fame, and the Dawahare’s/KHSAA Hall of Fame. And we’re not even including the fact that Strong has had nine (yes, 9!) holes-in-one in golf; or that among his high school classmates was longtime newspaperman Earl Cox, who remained a lifelong friend; or that Strong twice played fast-pitch softball against the world-famous Eddie Feigner (better known as “The King and his Court”), or that he played basketball in the Army and was a teammate of Ted Owens, who went on to become a highly successful coach at Kansas. Joe Ohr, who coached just about every sport at Irvine, had a profound influence on Strong, who played football, basketball and baseball for him. So after graduating from EKU, Strong, with an assist from McBrayer, got the basketball coaching job at Madison-Model in Richmond. He stayed one year before moving to Louisville to become basketball coach (and football assistant) at Male. He was there six seasons and earned a reputation as a tough-as-rawhide taskmaster. It was a reputation that he burnished throughout his career, from Male to Kentucky Wesleyan to Oklahoma State to EKU to Clark County (where he also served as principal in between coaching stints). Strong always stuck to his principles, even when it came to his bosses in administration. But there was another side to the coach who was so stern and caustic on the sidelines. Strong’s players may not have realized it at the time, but their coach was doing them a favor for relentlessly riding them. They came to that realization later, however. George Tinsley, a standout freshman on Kentucky Wesleyan’s 1966 championship team (who helped the Panthers also win it all in 1968 and 1969), paid tribute to Strong on the 40th anniversary of that first title. “His tough love for us and helping us believe in ourselves . . . will forever be ingrained in our hearts and minds,” Tinsley wrote. Guy Strong was inducted into the Kentucky Athletic Hall of Fame in 2002. Greaves moved to northern California in 1969 and didn’t reconnect with his former coach until 10 or 15 years ago. Then it all came into focus: the positive impact Strong had had on him. “When I came out to Silicon Valley, there were some tough software projects as competitive as basketball, a different game you might say. Looking back, I realized what Mr. Strong instilled in me — determination, never give up, go all out, discipline and teamwork. All those things he created in my insides served me well. And there was Strong’s penchant for scolding his players in a way that Burkhead found amusing. “He had so many one-liners,” Burkhead said, laughing. There was a road trip to Boone County, and some players weren’t comporting themselves to Strong’s liking. “So he stopped the bus and yelled, ‘This ain’t no Kings Island excursion!” Burkhead recalled. A few years later, thanks in part to Strong, Burkhead got a job with the FBI. He’s been with them ever since, and is now a Supervisory Special Agent in Dallas. Burkhead, who keeps in regular contact with Strong, realized long ago that his former coach had a softer side. For Reaves, that realization didn’t come until relatively recently. 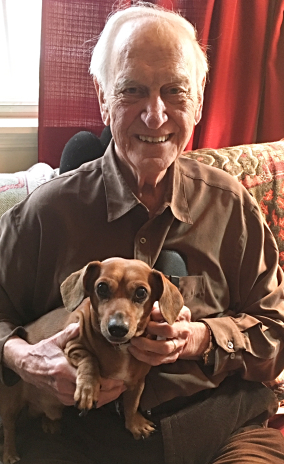 These days Strong is a nice guy to Samson, his miniature dachshund that, in a way, keeps his owner on a leash. Strong’s daughters — Mina (who lives just outside Chicago), Nancy (Jacksonville, Fla.) and Marla (Winchester) — keep tabs on their dad, who still watches plenty of basketball on TV and goes to Clark County games. Without prompting, he’ll tell you one of the most disappointing losses he ever had ended his first season (1983-84) at Clark County. The Cardinals were 25-5 and No. 6 in the state but were upset by Maysville 68-66 in the first round of the 10th Region tournament. “That one still hurts,” Strong said. You can take the guy out of basketball, but you can never take the basketball out of Guy. 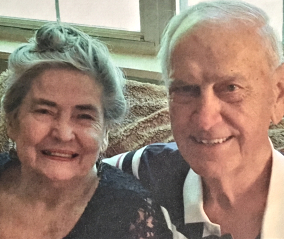 Guy and Aleen Strong were married for 64 1/2 years before she died in 2016.